The quiet, sea-washed town of Cayucos is the perfect setting for the Brown Butter Sea Salt Company. The specialty shop hand-rolls their signature cookies daily and ships them to gourmet shops and loyal followers all over the United States. The shop first opened as a specialty food store called the Little Market three years ago. “It was my brother-in-law, my sister, and me. We sold the brown-butter sea-salt cookie in the store. People would try one, they’d walk away, come back, and buy six. They’d call on the phone before they went home —because a lot of them were seasonal—and say, ‘We need four dozen before we leave town,’” owner and cofounder Christa Hozie recalled. “The Brown Butter Sea Salt Cookie is our version of a shortbread cookie. It’s browned butter, and brown sugar, and we hand-roll the cookie and we put a little bit of sea salt on top, so it’s a little bit salty and a little bit sweet. It’s very basic short- bread, but the browned butter gives the cookie a real nuttiness and richness. It’s a little different,” Christa Hozie explained. On December 5, 2008 Christa and her sister Tracie Nickson launched the Brown Butter Sea Salt Company with a specially designed box created by their sister-in-law Gina and also launched their website. They sent boxed samples with their story to potential wholesalers and let the cookie speak for itself. It was the perfect timing for a small indulgence at a small price. Besides filling orders for their 25 to 30 wholesale accounts and the online and phone orders, the storefront is now open from 10 a.m. to 3 p.m. Tuesday through Sunday, but they will stay open as long as they are selling cookies. They employ about seven people who help hand-roll the cookies daily. 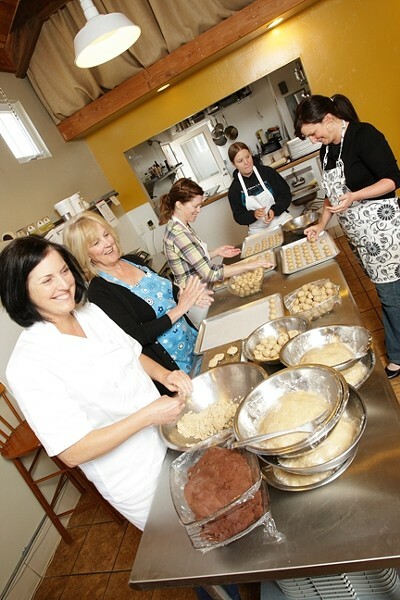 “When you come in you can sample cookies, plus you can look inside the shop and see the cookies being handmade. A lot of customers will come in and say, ‘Gosh, these cookies are being made right here’ and we are rolling them as they enter the store. There’s a little activity, and a little action,” Hozie said. They also make a chocolate-chip cookie with Scharffen Berger Chocolate, an oatmeal flame-raisin cookie using a traditional family recipe, and a handmade granola created by Tracie with ginger, local honey, coconut, almonds, and pecans. They recently developed a chocolate version of the Brown Butter Sea Salt cookie with cocoa, available only in the Cayucos store for now. Christa and Tracie feel supported by the community that has stood by them through their transition from specialty deli to the cookie company. “They believe in what we are doing. It’s great to make a handmade product in Cayucos that’s sold in New York and Los Angeles,” Hozie added. They provide local jobs, creating an artisan product. “We are really trying to grow slowly, take our time and do things right,” Hozie said. Tracie is working on special bridal favor packaging as well as corporate gifts. “It’s a dream. It’s so magical to see that people love what we’re doing, see orders come through, and to see something grow from the ground up is really, really fabulous,” Hozie said. The shop is located at 250 N. Ocean Ave in Cayucos. For more information, or to place an order, go online to brownbuttercookies.com or call 995-2076. The San Luis Obispo City Council has approved a property transfer to Habitat for Humanity. Habitat will build at least two separate homes in the city for low-income residents in 2010. Habitat for Humanity primarily relies on donations and volunteers to assist with building. To make a donation or to find out more information log on to hfhsloco.org. Tanya Gallardo contributed Strokes&Plugs this week. Send your business and nonprofit information to strokes@newtimesslo.com.